The wife of the President, Aisha Buhari, has expressed her profound appreciation to Nigerians for the successful return of her son, Yusuf Buhari, from medical treatment abroad after sustaining injury from motor-bike accident in Abuja. 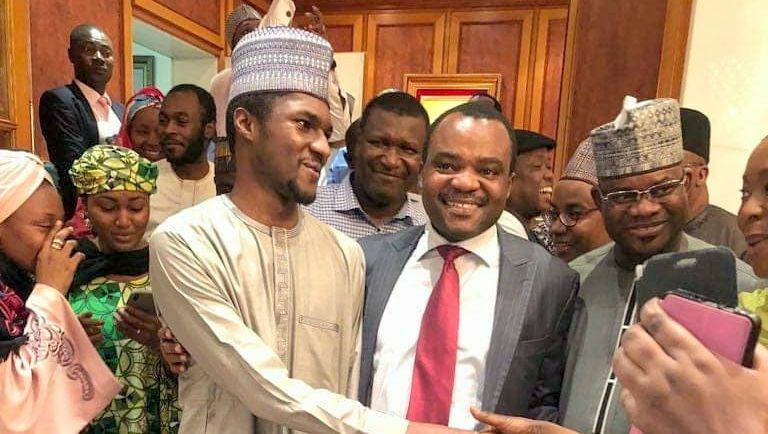 Mrs. Buhari, who expressed her appreciation on her tweeter handle on Thursday in Abuja, said the Buhari family remained grateful to all Nigerians for their constant prayers for recovery of Yusuf Buhari. ” We thank God for the return of our son Yusuf today after his medical trip. ” On behalf of the family I wish to express our appreciation for the goodwill and prayers since the unfortunate accident. ” May God Almighty bless all and continue to guide us all aright,” she tweeted. The News Agency of Nigeria reports that Yusuf arrived Nnamdi Azikiwe International Airport, Abuja at the early hours of Thursday. He was accompanied by the personal physician of his mother (Aisha Buhari), his elder sister Halima Buhari and other family members. NAN report that Yusuf was received at the Presidential villa by his parents, President Muhammadu Buhari and his wife Aisha, Minister of Interior Abdulrahman Danbazau, Governor Yahaya Bello of Kogi, Minister of State for Health, Osagie Ohineri, and other closed associate of the family.